It did not find any integrity violations. So that seems fine. OK then lets keep going with the next step. It didn't find any errors at all. I ran the CHKDSK C: /F /R with Administrator Account. It took a very long time! I left it working during the night. OK so now we know it is not a OS issue or a hard drive issue. 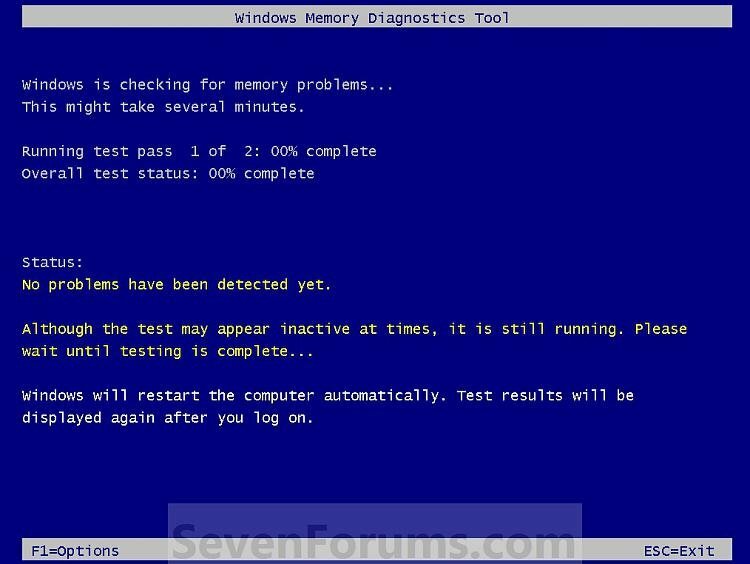 Now we check need to check the memory and since the dvd doesn't work we will have to use the built in Memory diagnostic program. The computer will now restart, and you will see this screen next. (See screenshot below. 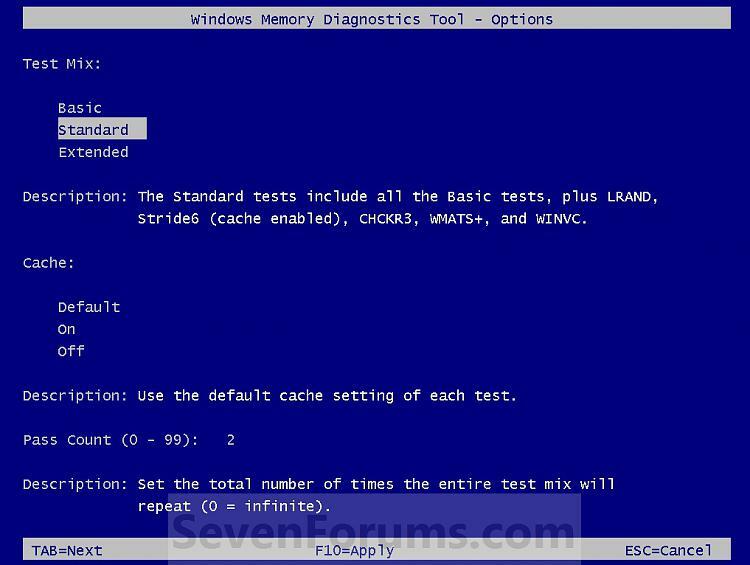 NOTE: If errors are found, the Windows Memory Diagnostics Tool will attempt to determine which particular memory module in your computer is causing these errors. If that information is available, it will be stated in the results after you log on from the restart. 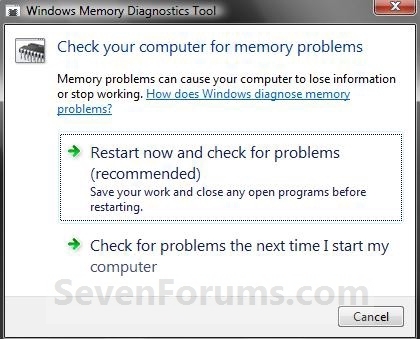 If bad memory is found then you will need to remove that memory and replace it. No Memory Errors were detected. It did two passes. Is there a way to fix the error the registry shows under the DVD portion? Or is that just not a problem? Edited by Laura Ann Brito, 06 October 2011 - 08:35 PM. If there was a actual registry issue SFC would have corrected it. Give this a try and let me know if it autostarts then. VLC is unable to open the MRL 'dvd://F:\'. Check the log for details. I feel badly that you are helping me so much, I really appreciate it. Why that is why we are all here and enjoy it so much. A good challenge is always welcome and your system is truly a new challenge. Can you check the VLC directory for the log and paste the corresponding entry for this error please. I looked in all the directories of this program and can't seem to find the log file. Is it somewhere I wouldn't expect? Open VLC and then click on Tools at the top and then on Messages. Is there anything showing in that file? Maybe I should un-install Windows Media Player? 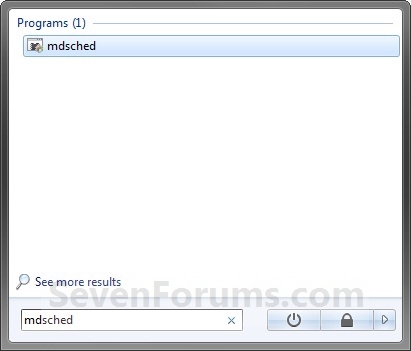 You can't really uninstall WMP because it is part of the OS now. You can see if there is any updates for it by opening it up and clicking on About[/b] which should have the Find Updates you can click on.